There's something so comforting about strolling around a farmer's market on a beautiful morning when the air is crisp and the sun is beaming. Everyone has their bags or carts filled to the brim with seasonal goodies, or in my case an excessive amount of honey straws. How can those things be so darn good?! It is literally honey in a straw, but for some reason it's the most blissful little treat. The sweet old lady who sells the honey that I love has been a beekeeper for 50+ years and it makes her day anytime someone visits her booth, so I love going over to say hello. I've said it before and I'll say it again, the Portland Farmer's Market is one of the best markets EVER. Farm fresh cheese and eggs to a Kimchi booth, flower stands and wine tasting, it has it all. To make it even better, the market has some of Portland's best food carts and stands scattered around. If you're like me, you first grab a coffee from Nossa Familia Coffee and then biscuits and Gravy from Pine State Biscuits. If you have a sweet tooth, then you head to Lauretta Jean's stand for a slice of pie or the most amazing brownie ever with a caramel core center. For the bechamel: In a small saucepan, melt butter over medium heat. Whisk in the flour and cook, stirring constantly, until you smell the flour and butter cooking, 2 to 3 minutes. Do not allow it to brown. Add the milk and and cook, stirring from time to time, until the mixture thickens like a soup, 10 minutes or so. Take off heat and stir in the Parmesan and half of gruyere cheese and let cool. Preheat the the oven to 425 degrees F. Place the 4 bottom halves of the croissants on a parchment paper-lined baking sheet, and spread with 1 tablespoon mustard over each. 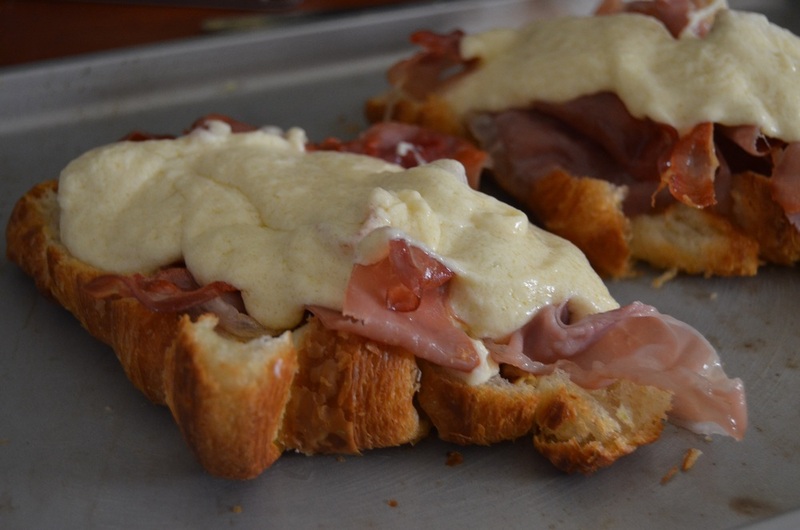 Place several slices of the crispy prosciutto and generously drizzle with bechamel sauce. Add the avocado slices and season with salt and pepper. Add the top halve of the croissant and gently push down. Drizzle the top of the bread with more cheese sauce (if you have any left) and then add the remaining Gruyère. Bake until cheese is bubbling and evenly browned, about 3–4 minutes. Meanwhile, heat butter in a large skillet over medium heat. Add eggs, season with salt and pepper, and cook until whites are cooked but yolks are still runny, about 3 minutes. Place an egg on top of each sandwich, and serve hot with fresh salt + pepper and a few fried sage leaves. Grab your forks, knives, and napkins and ENJOY! !